Middle Fork, located on the Renwick’s second floor, was built over the course of a year and was created from a plaster cast of a living tree—an old-growth hemlock growing in a forest near the middle fork of the Snoqualmie River in Washington. With the help of two arborists and nine assistants, plaster casts were taken of the tree’s trunk and limbs, from the root flare at the base up to a height of around 50 feet. 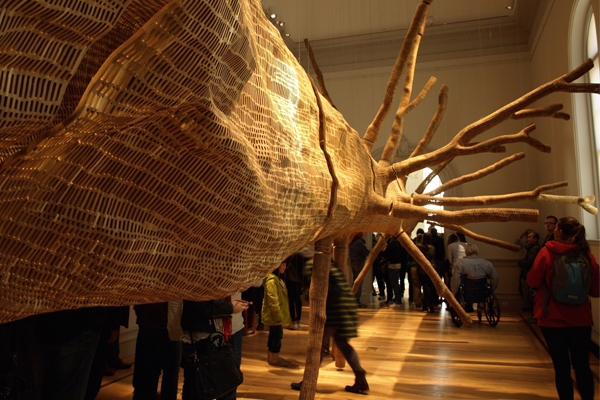 The casts were then transported to artist John Grade’s MadArt Studio in Seattle. There, hundreds of volunteers participated in constructing the sculpture. To create Middle Fork, Grade, his assistants, and numerous volunteers carefully placed thousands of salvaged cedar blocks around the plaster form, glued the blocks together, and then removed the plaster cast from inside, leaving just the web of cedar blocks, outlining the tree’s form in exacting detail. 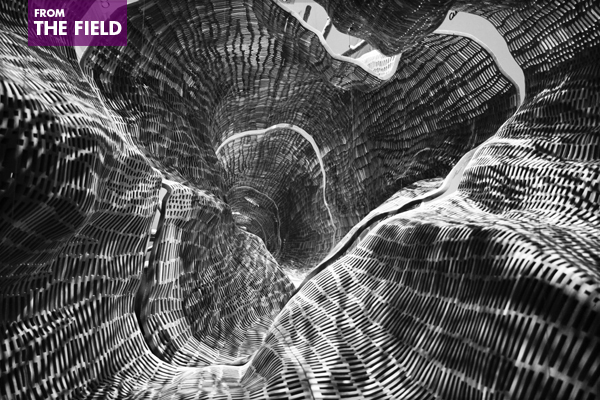 Grade’s aim was to engage as many people as possible in the construction of the sculpture. Passersby were invited right from the sidewalk into the studio, located in Seattle’s South Lake Union neighborhood, to take part in the process. 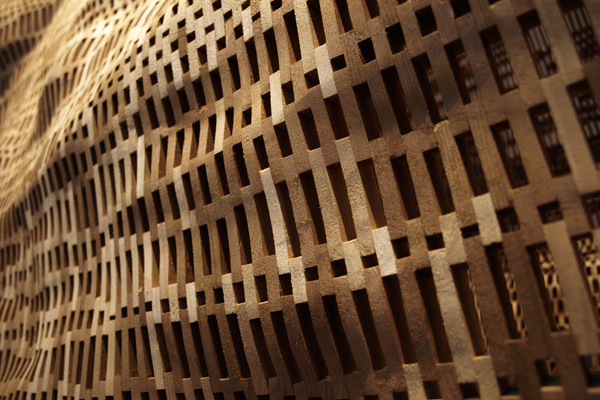 The overall effect of these tiny blocks meticulously assembled into a massive whole is one of incredible detail that evokes every bump and curve of the tree. 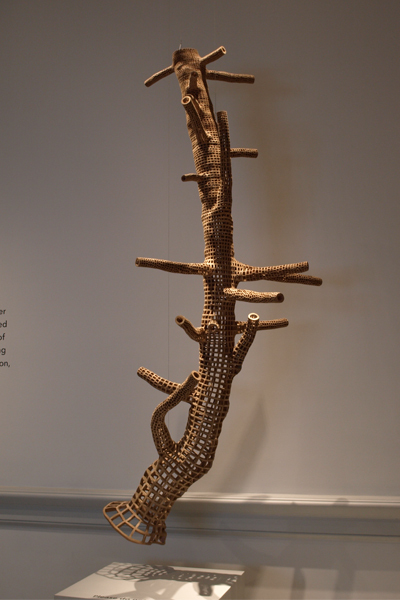 The final result is a “hollow, light-filled armature that holds the exact shape of the tree,” a perfect copy that also reflects the ephemerality of living things. Though an exact copy, the sculpture represents the particular moment in time when the cast was made, and no longer fits the tree—which continues to grow and change—from which it was molded. After the sculpture is no longer being exhibited, Middle Fork will be returned to the base of the hemlock tree from which it was made, to gradually disintegrate back into the soil and nourish the tree. The sculpture’s connection to nature and to the tree that gave it its form reflects the artist’s focus on the environment, and on our changing climate, which shapes much of his work. Huse highlighted some of the changes that have taken place in recent decades, showing a comparison of the USDA Hardiness Zone Map from 1990 to 2006 that makes clear the northward shift of warmer zones. As these alterations in temperature and precipitation occur, life cycles are disrupted and the genetic fitness of populations changes. Trees and other species that once thrived in certain locations are no longer suited to these areas as shifts in climate, and subsequently in ecology, reshape the world around us. 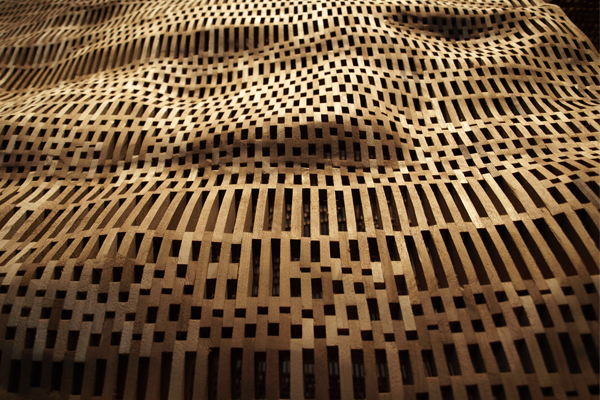 Downstairs in the Renwick is a second Middle Fork sculpture that offers a strong contrast to the larger piece. To create Middle Fork (Arctic), Grade traveled to northern Alaska and cast a rare balsam poplar that he found after days of searching. Though the casting and construction process for both sculptures was the same, the two could not be more different. Middle Fork (Arctic), though the same size as the whole tree Grade found, looks like a fragment—this could be a broken-off branch of Middle Fork (Cascades) or a small prototype for the larger installation. It gives viewers a contradictory sense of something fragile and feather-light, displayed in suspension, yet hardy enough to survive in the Arctic. As the Smithsonian Gardens Arborist, Huse is responsible for maintenance of the Smithsonian’s trees, all located in the controlled urban environment of Washington, DC, structural pruning, and maintaining the Smithsonian Tree Collection in GIS, which in the future will be made available online for anyone interested in seeing the collection. 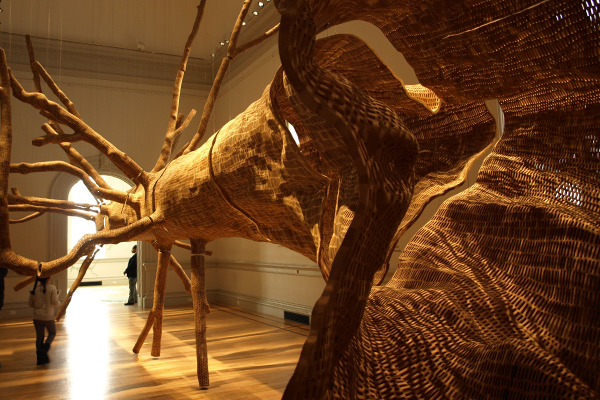 Giving a lecture at the Renwick may have been an usual assignment, but an arborist’s view of an installation so closely tied to ecology and so clearly inspired by nature was a welcome surprise. 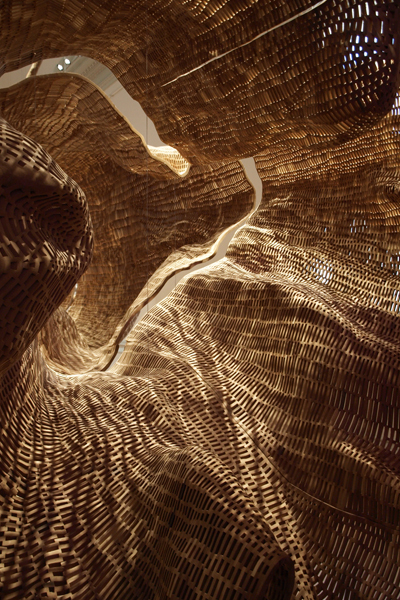 Artist John Grade will also be speaking at the Renwick on Sunday, February 28 about his Middle Fork installation. Even if you can’t make it to that event, WONDER is well worth a visit—the exhibition lives up to the name. Hey this is some great information. i own a tree service company, and have been in the tree care business for years. Cool article. Glad I ran into it.